There aren't many words for these. Yum is one of them. They are so darn easy and fancy it's almost unfair. You will want to make these. Soon. Like, today. The important thing is to start by pouring a glass of your favorite red wine. 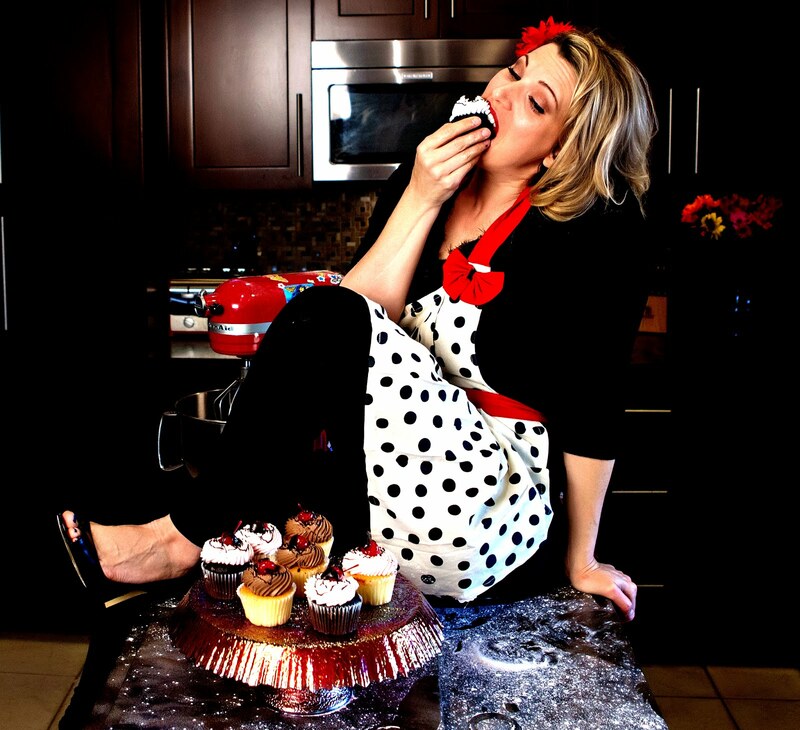 That makes it even more fun and delicious. Now, go to the store and get some fresh figs. 1. Pour yourself a glass of wine. Take a long sip. 3. 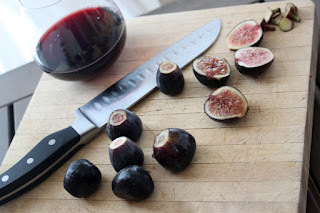 Cut the hard tips off the figs and cut them in half lengthwise down the middle. Continue to sip your wine. 4. Stuff a large chunk of Gorgonzola cheese into the middle of each fig half. These are delicious just like this if you're simple ingredient/recipe person! 5. 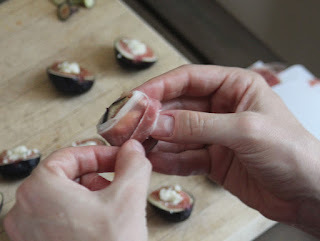 Tear the prosciutto into thin, uneven strips and wrap it around the stuffed figs. Don't worry about being neat or even, some of them will have more than others. 6. 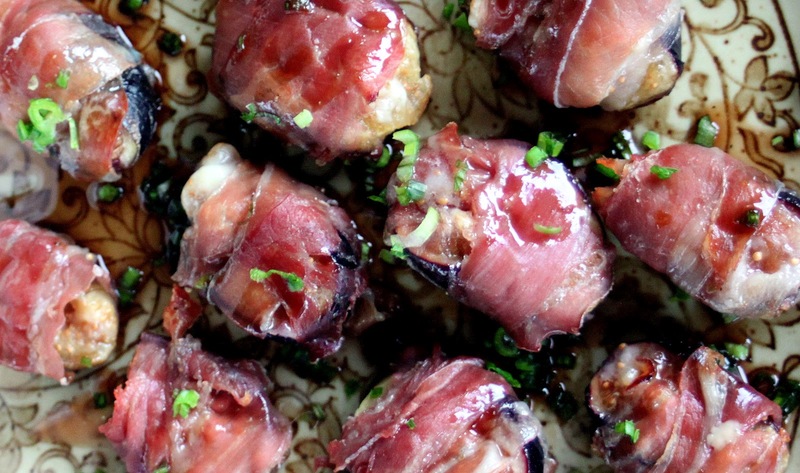 Place the figs on a cookie sheet and place them in the oven at 375 degrees for about 15 minutes. Be careful not to over cook them, the cheese will melt and leak out if they're cooked for too long. 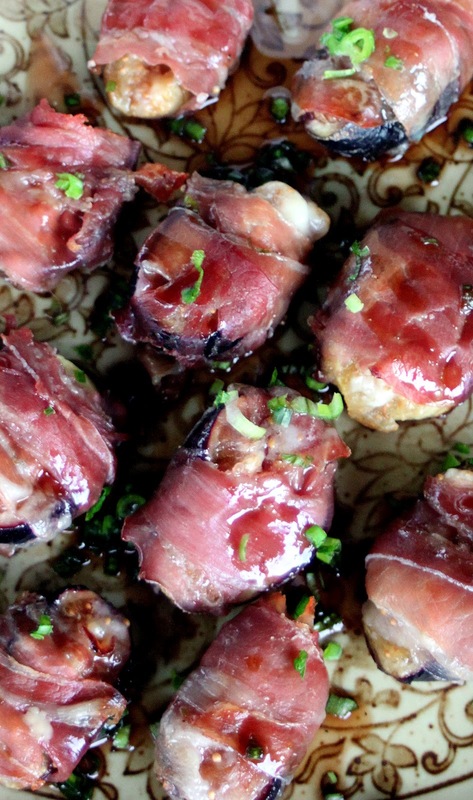 Just get the prosciutto warm and a little bit crisp. Remove from the heat and set aside. 7. For the glaze, combine the honey, balsamic vinegar, garlic powder, salt and pepper in a medium mixing bowl. Whisk until smooth and combined. Add in about 3/4 of the chopped scallions and stir. 8. 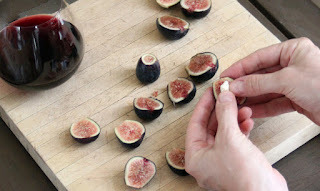 To serve: Transfer the figs to a serving dish and transfer the glaze to a small serving bowl. 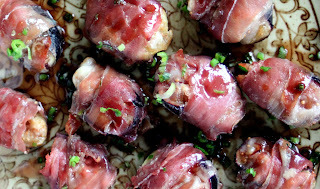 Drizzle some of the glaze over the figs with a spoon and garnish the figs with the rest of the scallions. Guzzle the rest of your wine and pour another glass to sip while you eat your figgies!